Invisalign offers an effective, discreet alternative to metal and ceramic braces. Dentists Dr. Ibtisam Rashid and Dr. Hana Rashid offer the innovative treatment in their Roseville, CA, office. Braces that use wires and brackets are no longer the only option if you want to improve your smile. The Invisalign system relies on clear, removable aligner trays that place constant, gentle pressure on teeth. Before your treatment begins, your Roseville dentist will take digital impressions, X-rays and photographs of your smile. The digital information will be combined to create a three-dimensional image of your mouth that can be manipulated to create a virtual representation of your orthodontic treatment. You'll receive a series of aligner trays created just for you and will wear the trays for approximately 22 hours per day. At the end of every two-week period, you'll replace your current set of trays with a new set. A Less Noticeable Orthodontic Option : Your clear aligner trays will fit your teeth snugly, making them virtually invisible. Invisalign is an excellent option if you prefer a more subtle tooth straightening option. 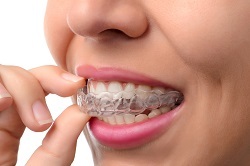 A Comfortable Orthodontic Experience : Aligners are made of smooth plastic for your comfort. You won't have to worry about cuts from stray wires and will never need painful adjustments. No Hassles: Brushing and flossing become much more time consuming if you wear metal or ceramic braces. You won't have to make a single change to your usual oral hygiene routine with Invisalign. You'll remove the trays when you brush and floss, rinse them and put them back in your mouth. Limitless Food Options : Wearing traditional braces requires avoiding hard or sticky foods. Luckily, your diet doesn't have to change when you opt for Invisalign treatment. You'll remove your aligner trays when you eat or drink anything other than water, allowing you to eat anything you want. Reduced Treatment Time (for Adults) : You may only need to wear your aligner trays for about a year if you're an adult. If you're a child or teenager, you'll probably need to wear the trays for about two years or longer. Enhance your smile with Invisalign! Call Roseville, CA, dentists Dr. Ibtisam Rashid and Dr. Hana Rashid at (916) 780-1955 to schedule your appointment.